The weekly newspaper, The Herald of Randolph, is housed in an old building in “downtown” Randolph, Vermont. It smells of ink and newsprint and old metal type. Like my father’s weekly in Rochester, NY, The Labor News, when I was young. My father was the editor of the AFL-CIO newspaper, until Mario Cuomo bestowed upon him the title of Deputy Commissioner of Labor for New York State. When I walk into the Herald I fall back 55 years, just for a second, but then get on with the business of self promotion and I’m a writer or an artist or an innkeeper or costuming the local children’s summer musical, curating a local art show, and looking for free advertising, which the Herald is always so generous to provide. I stopped in on Friday with the press release and glossy flyer for I Wasn’t Strong Like This When I Started Out, Stories of Becoming a Nurse, the Creative Non Fiction anthology that comes out next week. I have a piece in the collection. It’s a big deal. As many of you know from my constant complaining, life in Vermont has not been easy for me, Vermont has not been what I expected it to be when I dragged my family here in 2001. But then again, is anything? The point is, big deals are very big deals to me, here in my self-involved, angst-driven little essayist’s head. AH, much better. I bought two copies. 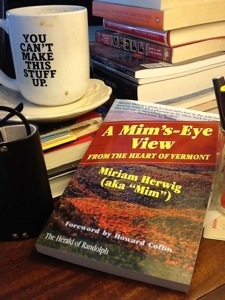 A Mim’s-Eye View: from the heart of Vermont, The Public Press, can be ordered by contacting http://www.ourherald.com . I would highly recommend it. The pile of the unread, the partly listened to, the somewhat downloaded waxes and wanes with my ability to stay awake and finish anything. Teetering on my bedside table we find David Foster Wallace, Richard McCann, Virginia Woolf, a book on collectible Japanese scrap, a book on making handmade books, Lee Gutkind, Erin Morgenstern, several personal journals and several literary journals, several books on writing, some humorous essays, a book I should be reading on neuroplasticity, and a book on hoarding. The piles on the floor include my father’s unfinished novels, notebooks for my own unfinished novel, novels to give away, and that doesn’t even begin to cover the desk and the top of the dresser- which seems to be more the repository for non-fiction. My Kindle is in my tote bag with All the Beautiful Tomorrows, a sample of George Saunders, my micro-fiction, and then there is the unbearable Eating Animals by Jonathan Safran Foer on my iPhone, made more unbearable as an Audible. 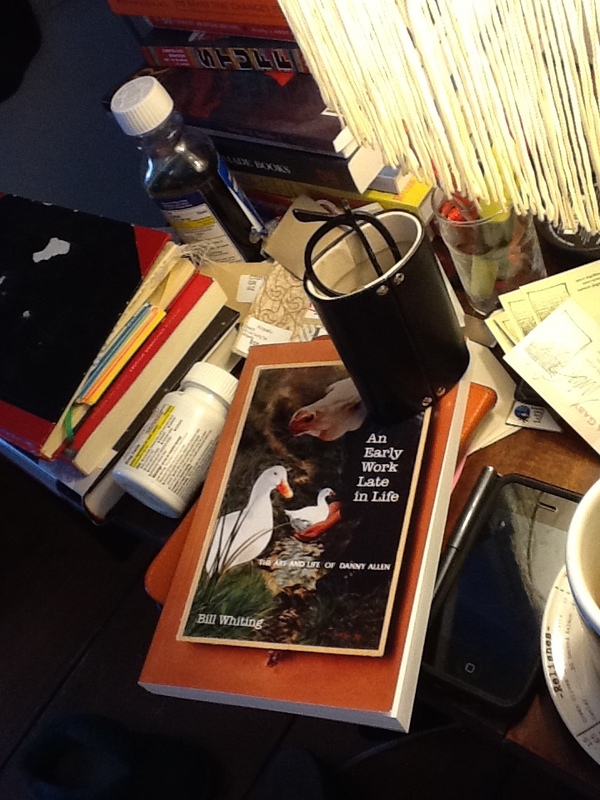 What made me finish Bill Whiting’s An Early Work Late in Life: the art and life of Danny Allen in one wide awake siting? Well the obvious; having just come from the book launch in Rochester, NY, where people I knew were part of Danny Allen’s life and the artwork in the book. Much of that art work had been part of my life as a young art student, pieces that my friend Eva Weiss had in her apartment where we spent so much time, Eva having been part of the art scene that Bill Whiting describes so vividly, a scene I just missed by a few years. I was jealous of that time. Rochester Institute of Technology had already moved its art department to the sterile brick netherlands of suburban Henrietta, NY by the time I moved back to the US from Jerusalem, where I had been attending Bezalel Academy of Art and Design. Bezalel had been cool in its own way, but not the cool-hippie-beatnik-crazy artist cool that I imagined was the Cornhill district during Bill and Danny’s time. What else kept me so attentive? I resonate emotionally with the content, my two genres- creative non-fiction and suicide. 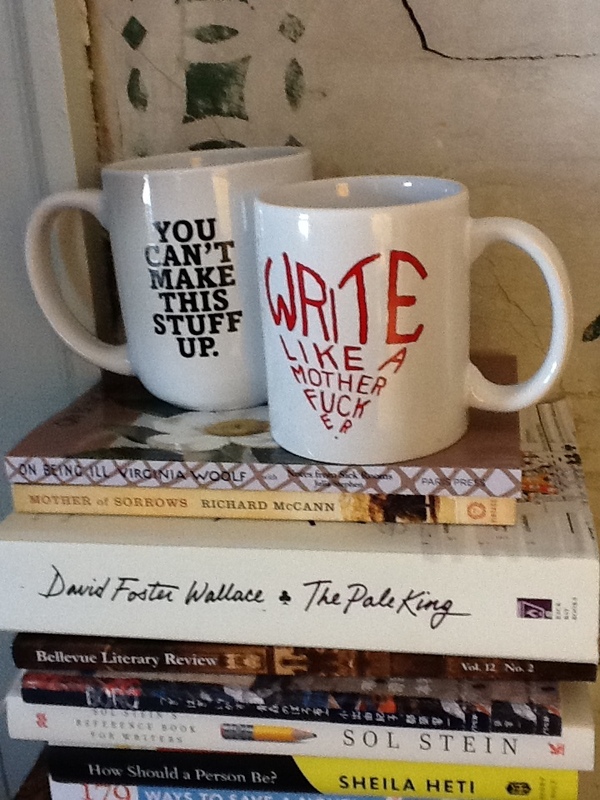 I’m a writer of creative non fiction. And a psychiatric nurse practitioner who deals with suicide narratives every day. Those patients who have tried and failed and are happy to be telling me about it, those who are not so happy they failed and for whom we need to start the arduous process of finding a hospital bed, those who have survived the successes and failures of others. My own family history, my own narrative of depression. Emotional attachment not-withstanding, does the book stand on its own? Yes it is fearless in its self-disclosure, yes it is honest in its dedication to the truth of such a loss, yes. Yes. But more than that, it chronicles a tender time in our history, and an innocent look at unraveling. Would we have treated Danny Allen’s journals, painstakingly reproduced, today as tangentiality, as ‘word salad’ – yes a real clinical term- as evidence of mania, tried to find a bed? Some Abilify for its capacity to slow things down without fattening them up or putting them to sleep? Or as Bill suggests, “if he were treated for his mental illness, would he have ceased to have that spark that defined him?” Would Danny Allen’s art withstood the test of time? Gestures simple and complex, Beardsley-like puzzles, intricate shadowboxes, the imploring glance of the cow in Sunny Ducks on the cover of the book. Oh yes. And now they can. That’s how long copyrights last. So by my calculations, if I actually got a book deal this year, and I have at best another 30 years ( although how many of them will actually be cogent?) then in 100 years someone could actually legally plagiarize me. 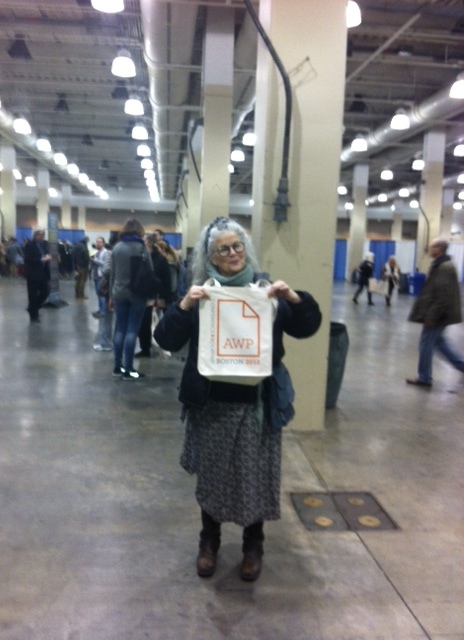 And I find that a hopeful fact, this, my last day at my first AWP. By some estimates, there are 13,000 attendees here at the Boston conference. I have marveled through readings by Jeanette Winterson, Seamus Heaney, Don DeLillo, Philip Lopate, and almost got thrown out while David Shields was reading his essay constructed solely from bumper sticker slogans for laughing too loud (see Alexis Paige’s Brevity blog for details.) The book fair is a stunning gallery of seemingly thousands of lit mags, each more beautiful than the next, a “salon de refusees” for me, as so many of them have rejected my work. I must say, by the end of the day, it pleased me to have a little fight with THE SUN magazine, their poster crying “submit submit submit!” And to meet Danielle Offri, grandmother of medical narrative, editor of the BELLEVUE LITERARY REVIEW, and swear I will keep trying. Meeting the crew from CREATIVE NON FICTION was indeed a joy, as they have accepted me, and reassured me that no one will sue me for anything said in my upcoming essay with them. They also told me that their fact-checking went so far as to verify that I indeed have sculptural vessels in the national collection of the Smithsonian, and that they are “so beautiful.” Everyone here has a story to tell, 13,000 writers, 700 presenters, little old me….and in 70 years which of will be worth stealing from? Boston conference center. What if there is a fire? That’ s my first thought. not, OMG I get to hear Seamus Haney, or what if I meet the agent of my dreams? sneak into to hide, breath mindfully, and recharge my appliances? 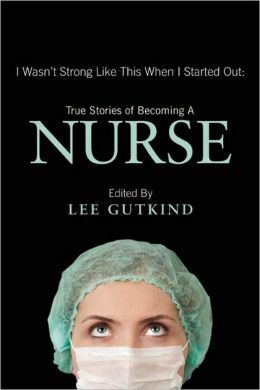 Here is the press release for the upcoming Creative Non-Fiction anthology, edited by Lee Gutkind, which contains my essay: “Careening Towards Reunion”: I Wasn’t Strong Like This When I Started Out: True Stories of Becoming a Nurse.